Misanthrope's Thoughts: Do You Know What You Show at Your Map? What is the cause for the degradation of environment? Capitalism, corruption, consuming society? - OVERPOPULATION! Do You Know What You Show at Your Map? As access to the GIS and mapping is becoming easier every year the more people and companies create maps. Unfortunately often they just do not know what they are actually showing at their maps. This issue is being mentioned over and over again. Amongst the other info they show the Infection rank for each country... based on total threats detected.... You may have already guessed what is the fail, but I let me explain it anyway. See, the №1 infected country is Russia, which is the home country for Kaspersky and where this antivirus is quite popular. So we can conclude that the rankings that supposed to demonstrate the severity of virus activities merely demonstrates the number of Kaspersky software installations across the globe. The linear model is fairly close to Inrection rank = Population rank. It is clear that the phenomena that is presented as an Infection rank just reflects a total software installations per country and not the severity of the 'cyberthreat'. In order to get the actual Infection rank the number of detected threats have to be normalised by the number of software installations. If you do want some security data to play with, hit us up at @hrbrmstr & @jayjacobs on Twitter or bob at rudis dot net. I don't think that software installations per country have much to do with this graph. Without any Kaspersky installations, we would also expect to see the same graph: more people in a country -> more computers -> more infections. You have a point, and this logic was implied in my post. See... Does the total number of infection gives us some useful information? - No! It only tells us about the population number (and you mentioned it yourself). 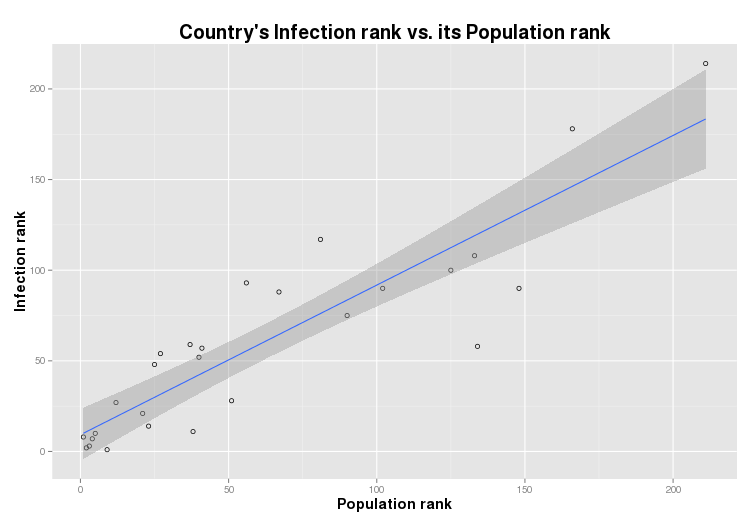 So the number of infections has to be normalised by population (by computers to be more precise) to be meaningful. In this particular case the data was acquired from the certain single source - Kaspersky antivirus, so instead of normalising data by computers or population we have to use Kaspersky installation to get the correct result (in other case you won't be able to explain why Russia is the most infected country). How to Predict Where Will Next Disaster Strike? Disasters: Myth or the Reality? Misanthrope's thoughts by S.S. Rebelious is licensed under a Creative Commons Attribution-NonCommercial-ShareAlike 3.0 Unported License.